Today I was in charge of the ongoing workshop on acoustics and textiles. I’d prepared for three sessions on different topics but then along came a fourth and really exciting one. Texture I – First installation I did apart that it was never properly presented. A turning pojnt for myself towards working on sound instead of written music as well as moving from concert setting to installation/sound in space. Ekkofisk: Last week Tor Halmrast had been talking about formants. We used formants as part of the voice synthesis. I also played them some examples of how the synthesised voices sounded without any reverb to illustrate how important the added reverb was to creating an illution of authentic voice. Motlyd – I mainly talked about how Maia Urstad and Jana Winderen managed to visually transform the room so that the sound was “on display”. Norway Remixed – Mainly focused on the experience when working on sound in public space problems raised our attempted solutions and experience gained as part of the project. This project also gave an example of using parabolic loudspeakers as well as a custom-designed room intended to prevent sound leaking back and forth between the installation and the outside space as well as controlling the acoustic properties of the room used for the main part of the installation. Dialog/Overgang (Dialogue/Transition) – how I wanted to use the space as well as the acoustic properties of the space. For some reason this is the best gallery space I’ve ever worked in acoustically quite surprising considering the dimensions of the room (approx. 60 × 10 × 4 meters). The two possible explanations I can think of are that all of the floor had carpet functioning as an absorber. In addition I believe that the surface areal of floor walls and ceiling is relatively high compared to the total volume of the space. Thus according to the Sabine Absorption Equation the decay time should be shorter than immediately expected for such a large space. Elektropoesia – For this installation a custom room was built at Malmökonsthall. The room had double walls for sound insulation but the surfaces of the room were all hard (wooden floor gypsum board) so it was quite reverbant. I also suspect that it had quite a few resonant frequencies. White-out – Visningsrommet USF is by far the most challenging room I’ve ever worked in acoustically. It is subdivided into two rooms. The outer room is wide open to the rest of the world including the automatic door just outside as well as the café across the corridor. This implies a lot of intruding noise. The inner room is all very hard and non-absorbing surfaces: concrete floor and walls gypsum boards concrete roof. It was more or less impossible to develop sound for the installation out of the room. Anything developed at home or the studio turned out not working in the space and I had to develop all of the sound in the room. I managed to get it working in the ned but I want to avoid a similar situation in the future if I can. I’d prepared a Max patch that was easy to fiddle around with in order to do a practical demonstration of some of the concepts introduced last week by Tor: Frequency wavelength spectrum harmonic content formants logarithmic perception etc. I also played a sound file with some text and applied reverb (Audio Ease impulse responses) to it while looking at the sonogram. It was quite instructive to see how all transitional sound was smeared out if the reverb got big enough. 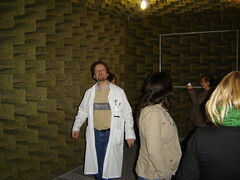 While I was lecturing I received a call from Haukeland confirming that we could come to see the anechoic chamber. Of we went in a maxi-taxi. I’ve posted more photos at Flickr. Actually there seem to be more than one hundred variations but it is easy to lose count a fact that takes us to the very heart of the work. If played complete it is exceedingly long as passacaglias and ciaconas tend to be from this time on. The intention clearly is to go on so long that time seems to stop hang suspended in the magic mood created by the excotic rythms. I bet Clear Channel would love this. Wow! I’ve just discovered that there’s an anechoic chamber here in Bergen at Haukeland universitetssykehus. My wife accidently mentioned that she’d seen one in a corridor once and now I got it confirmed. I don’t know who’s in charge of the room yet or what it’s used for (and how much) but this could potentially be very exciting news for everyone working on sound art in Bergen. This and next week I’m participating in a very interesting cross-diciplinary workshop on acoustics and textiles. I’m currently trying to arrange for us to get to see it sometime next week. Wojciech Kosma has made an Max external for interfacing with Skype. COOPER is a flexible environment which allows to control patches from a meta-parameter-level. which are connected to each other through a matrix. can be recorded into a figure-file. without the need to control every single parameter by hand. a figure can itsself contain commands to play figures (which themselfs can play figures etc). for all modules touched within the time recorded. and you can of course write figures by hand or with other programs. it’s easy to integrate custum patches as modules into the environment. COOPER will not work with versions of Max/MSP prior to 4.5.×. currently COOPER runs only under Mac OS X.
Jamoma 0.2.1 has been released. I’m just back from Lyon and a four day visit to experience duration or the Biennale d’art contemporain de Lyon 2005 to be more precise. It have been bery very interesting and is well worth visiting. I’ll try to find time to write more about parts of it later today or tomorrow. As part of the recent Eno reissue series soon to come is a DVD called 14 Video Paintings that contains both Mistaken Memories of Mediaeval Manhattan and Thursday Afternoon…now this is welcome! TEKS and PNEK might have to close down! TEKS Trondheim Electronic Arts Centre and PNEK the Norwegian Production Network for Electronic Arts have reached the 3 year limit for financial support from Arts Council Norway. We have therefore applied for governmental funding from 2006.000 The proposed National Budget does not suggest further support for TEKS and PNEK despite the government’s own cultural policy guidelines which states that TEKS and PNEK must be given permanent funding. For this reason we might be forced to close down early next year. I can only imagine how something like this would work if positioned at Torgallmenningen the central plaza of Bergen. Today I’ve attempted to document my installation at the Generator.x exhibition. Ut was difficult as the listening room is fairly dar. Also it’s a installation of sound only so there’s not much to point the video camera at really. I also took a number of stills so I’ll have to see what I can come up with in the end. I wrote an artist statement for the installation. Unfortunately the title of the work name of artist and the statement has never been put up somewhere outside the box. The statement I sent to marius just before the opening (I was probably to late providing it to him) was in English. That’s sort of backward and stupid when the work is exhibited in Norway. So today I made a Norwegian version and mailed to the producer of the exhibition. Coming Sunday is the last day for the exhibition in Oslo but it will be touring for the next coupple of years. Hopefully the text will be included for the coming exhibitions. I’m including English and Norwegian text below. I used to go for walks at the Sandviken mountain in Bergen. Some spots I would come back to again and again observing how they changed with weather and season. I have never wanted much to happen in the music I make. Instead I would like to create similar sonic environments to visit and revisit places drifting with subtle fluctuations at various time scales a kind of artificial nature free from traces of human influence. For a long time I have wanted to use meteorological data as an input to control my work. Even when doing so the idea of escaping human presence turns out to be difficult to achieve. Changes in the atmosphere currently affects the climate. There is a lot of research being carried out at the moment to better understand the implications. For this project I’ve got access to data from simulations carried out at Bjerknes Centre for Climate Research studying the development of the climate to the year 2100 and beyond. The parameters used to generate the sound of the installation are driven by a long term prognosis of the weather in Bergen 2046-2065. Time is accelerated so that a day passes in a minute or so. If you come back it might be another season another year. Most likely you won’t be able to recognize any long term changes. Jeg pleide å gå turer på Sandviksfjellet. Noen steder kom jeg tilbake til igjen og igjen og så hvordan de skiftet med været og årstidene. Jeg har aldri vært opptatt av at det skal skje så mye i den musikken jeg lager. I stedet har jeg ønsket å skape lydlige steder man kan oppsøke kanskje flere ganger. Jeg har hatt lyst at disse stedene skal ha en iboende drift fluktuasjoner på ulike tidsskalaer – en form for kunstig natur fri fra spor av menneskelig på virkning. Lenge har jeg hatt lyst å la værdata styre lydinstallasjoner. Men det er ikke dermed sikkert at resultatet blir en uberørt virtuell natur. Vi er i ferd med å endre atmosfærens sammensetting og dermed klimaet. Til dette prosjektet har jeg fått tilgang til data fra simuleringer gjort ved Bjerknes senter for klimaforskning der de studerer klimaet frem til og forbi år 2100. Lyden i denne installasjonen drives av en langsiktig prognose for været i Bergen i perioden 2046-2065. Tiden har blitt akselerert slik at en dag passerer på et minutt. Hvis du kommer tilbake er det kanskje en annen årstid og et annet år men de langsiktige endringene skjer så gradvis at de kan være vanskelig å oppfatte. Støttet av Kunsthøgskolen i Bergen og Soundscape Studios A/S. Kunstneren vil spesielt takke Frode Flatøy ved Bjerknes senter for klimaforskning for generøs hjelp i arbeidet med å skaffe til veie data. Hipno a set of Pluggo-based VST/RTAS/Audio Unit plugins made by Electrotap has been released. AFAIK most of it is made by Tim Place and Nathan Wolek but I believe there’s a tiny little bit of code by yours truely in one of the modulator pugs. Stochos software for working on stochastic granular synthesis according to theories amd ideas put forward by Xenakis in Formalized Music is now available for download. Stochos is a stand-alone application built in MaxMSP and is available for Mac OSX only. It’s available for free for educational purposes only. Stochos was described in an article in CMJ 2003: Bokesoy S. &amp Pape G: “Stochos: Software for Real-Time Synthesis of Stochastic Music” in Computer Music Journal (MIT Press) 27(3) 2003.000 – pp. 33-43. SPEAR is an application for audio analysis editing and synthesis. The analysis procedure (which is based on the traditional McAulay-Quatieri technique) attempts to represent a sound with many individual sinusoidal tracks (partials) each corresponding to a single sinusoidal wave with time varying frequency and amplitude. Spear somewhat resemblesAudioSculpt but lack most of the more advanced features of AudioSculpt. Still a welcome addition to the toolbox. Spear was described in an ICMC 2005 paper. Yesterday I had a session at the gallery space with my two supervisors Jeremy Welsh and Morten Eide Pedersen. I generally find it very fruitful to have supervisions after having completed new projects. That’s the stage where the most new thoughts ideas problems and questions are coming up in it’s useful to sort out and clarify thoughts through conversations. In addition thy can provide a different set of eyes ears and mindsets and thus point to issues that I’m blind to or not aware of myself. Today I’ve had two sessions at the gallery space. In the morning I did a presentation to staff at KHIB. Most of the artistic staff at the art academy is out of town this week but I had some really fruitful discussions with Jack Lohman further elaborating on issues already brough up during the discussions with Jeremy and Morten. Later in the day I was spending time documenting the installation and then conducting (literally as you can see…) a self presentation for the master students at KHIB. Due to some strange twist of the weather this year the summer was on a Friday (today) so afterwards I ended up having the last outdoor beers of the season at Verftet. I’ve now been a research fellow in the arts for almost two years. The duration of the fellowship is three years so it’s about time to start planning how to finalize the period and project. Monday this week I had a meeting with the rector Nina Malterud and director Johan Haarberg of Bergen National Academy of the Arts (KHIB) as well as my two supervisors Jeremy Welsh and Morten Eide Pedersen. The fellowship program do not (yet) lead to a formal degree but we’ll be evaluated for associative professor competence. The “product” so to speak of the fellowship project is two-fold. In my case the primary part is the number of art projects I’ve realized during the period but I also have to provide documentation and reflections on the artistic process itself. All of my art projects tend to be temporary so evaluation to a large degree depends on the documentation of the projects. I’ll be doing one project near the end of the fellowship period so that it can be experienced in “real life” by the evaluating committee. My fellowship terminates by the end of October next year so for practical reasons this project should take place late August/early September. I have still not any agreement on where to exhibit this. We discussed several possible options in the meeting and I’ll investigate these further. For a number of obvious reasons KHIB would very much prefer the project to take place in Bergen. I imagine the documentation in the form of a book or booklet with a DVD and possibly CD insert. The book should contain one section providing brief descriptions of the various projects carried out including photos and another section covering the “documentation of the process”. This section I’d like to do in the form of a series of essays on various topics of interest. The publication should be in English. The DVD would contain video documentation of projects carried out over the period of the fellowship. I have completed documentation of most of the projects but would probably have to ensure a common layout for titles etc. In addition I’d like the sound to be properly mastered. As a side project to this documentation I’d like to update my web pages so that projects are properly documented. This is a major job and I don’t think I’ll have the time to start working on it before spring. This web log will of course also form a background and addendum to the documentation. I’ll have to apply to be evaluated at least 6 months in advance. For this application I have to give a description of the project sketch the planned documentation and document that obligatory requirements have been met. The application have to be recommended by my supervisors. If possible KHIB and the board of the program would like to receive this application earlier. In the long run they’ll change this regulation so that one have to apply for being evaluated 9 months in advance. There’s a general deadline for applications for grants for publications at KHIB February 1st. My publication might not be funded the same way but we all agreed that February 1st seemed a reasonable deadline for the next formal steps to be taken. By then plans for finalizing should be pretty clear I should apply for being evaluated apply for grants for the publication as well as raise issues concerning funding of the final project to be carried out. Johan also recommended planning backwards from the end of the fellowship period. That seems a good idea. By the end of October next year all required documentation should be completed and handed in publication prepared for printing etc. In short everything requiring work on my side should be completed. I really want to finish in time. I know several PhD students that got into serious problems by not finishing in time. Suddenly they didn’t have funding and time for further work and it all came to a halt. At all costs I want to avoid that situation. I’ve been pushing myself hard all the way thinking that I do not have a lot of time and continuously put myself in situations were I’m forced to keep a certain level of productivity. The final year will probably be a busy one as well but I should be able to make it in time. I’m not sure I’ll be able to take a long summer vacation next year though. If everything is completed in time the evaluation could happen sometimes late next fall and the book could go to print at about the same time. Finding a place for the final project and start planning it. Start working on final project description the application for being evaluated etc. In addition I should start writing up on the essays and descriptions of projects. Next week there is a gathering of the fellowship program. During one of the sessions we’ll be filled in with additional information on formalities. Jan Jacob Hofman has implemented 2nd order ambisonic encoding and decoding in Csound. The implementation is extended with additional techniques for spatialisation and offers instruments for creation of a trajectory for the movement of 20 coexisting sources in 3d space combination of the soundfile with distance clues and creation of a sonic environment and spatialisation of the sound the reverberation and the early reflections using the Ambisonic equations. Here is a direct link to the goodies. The last two weeks have been insane. The Generator.x exhibition opened in Oslo Friday 23rd of September. The conference took place on the 23rd and 24th. I missed the first day of the conference. Instead I was busy finalizing the installation for the opening. There’s always a lot of practical issues to sort out. In addition the kind of loudspeakers I used 4 custom built Amina flat panel speakers caused some acoustic challenges that took a while to solve. Running pink noise through them was let’s say interesting. The frequency response was not flat. I had to experiment a lot with multi-band compression and EQ to get them to work but managed to do so in the end. I was fortunate to be able to stay behind at the gallery space for two nights after everyone else had left so that I could play around and test without being disturbed by others working and making noise. The speakers look great though and in the end I was quite happy that I’d chosen to use them instead of plain loudspeakers. I did a brief and not very well prepared presentation of my own work at the conference Saturday. The rest of the conference was interesting in particular the lecture by Golan Levin and the final panel debate. Unfortunately no one seemed willing to take the challenge by HC Gilje on discussing the aesthetics and artistic content/ambitions of a lot of generative arts. Sunday I got back to Bergen and the rest of last week was spent preparing the White-out exhibition opening Friday at USF. Saturday and Sunday I’ve been doing as little as I can apart from sleeping and I feel like staying in relaxed mode for a few more days mainly trying to catch up with mails documenting the exhibitions etc.